A few weeks ago Rabbi Schlesinger spoke and taught at a number of venues in Maryland and Virginia. On February 5, he was a guest of the Oakbrook Church in Reston Virginia. Guided by one of its pastors, John Moyle, the church is an ardent supporter of Israel and at the same time of Palestinian Israeli rapprochement. John has been instrumental in helping Rabbi Schlesinger to move forward in his work in Israel of building bridges of understanding and friendship between Palestinians and Israeli settlers. Building upon their collaboration, John invited the rabbi to speak to the church about his personal path as a Zionist and a settler who is both deeply committed to the Land of Israel and to peace and understanding between Jews and Palestinians. The second of Rabbi Schlesinger’s short teaching trips to Dallas was a resounding success. Continuing and expanding his interfaith bridge-building and Israel advocacy, Rabbi Schlesinger spoke in four different churches during this visit to Dallas, two of them houses of worship he had not previously visited. Both of these two, the Preston Hollow Presbyterian Church and the Northwood Church in Keller, have already invited the rabbi back for a return visit! At Northwood he was a participant in the Global Faith Forum, where he met with American and Middle Eastern Christian and Muslim leaders and led sessions on Judaism and on the Jewish People’s connection to the Land of Israel. In the wake of his presentations at the Global Faith Forum, three separate Christian institutions that regularly bring groups to the Holy Land have asked Rabbi Schlesinger to arrange for their people to to visit his home town of Alon Shvut and to study with him. VIDEO from the November Faiths in Conversation program focused on the subject of war. The trialogue begins at the 28th minute, Rabbi Schlesinger’s comments begin at the 30th minute. Many of you have probably heard by now that after 8 wonderful years in Dallas, the time has come for me to head back home to Israel. My wife, my children, my grandchildren, and – as I see it – the most meaningful present and future of the Jewish people, are awaiting me there. I am very sorry to leave behind the friends and students who have become such an integral part of my life, but I am also looking forward to the next stage of my life. Plans have not been completely finalized, but it looks like I will be involved in Jewish education and interfaith relationships in Israel. Part of the plan – and I hope very much that it will work out – is that I will be flying back to Dallas for a few days each month in order to continue some of the programs and classes that I have been involved in in our city. Stay tuned to the Jewish Studies Initiative weekly blasts and to this website for further developments. Rabbi Hanan Schlesinger has been named a Memnosyne Institute Interfaith Scholar, a program initiated by The Center for Interfaith Inquiry at the Memnosyne Institute in Dallas, Texas. The Institute’s interfaith efforts bring together scholars and practitioners of all faiths who seek common ground for understanding and practical service to humanity through a cooperative and collaborative approach. The Memnosyne Institute is proud to welcome Rabbi Hanan Schlesinger as the newest addition to the Interfaith Scholars initiative. Rabbi Schlesinger joins the Memnosyne Institute with over 20 years’ experience in teaching Jewish studies, dividing his time between Dallas and Israel in various colleges of Jewish studies, synagogues, seminaries, mosques and churches. Currently he serves as Founder, Executive Director and Community Rabbinic Scholar of the Jewish Studies Initiative of North Texas. Before that, he was with the Community Kollel of Dallas for five years. Rabbi Schlesinger is a member of the Rabbinical Council of America and the International Rabbinic Fellowship, as well as of the Rabbinic Association of Greater Dallas. He is a receipient of a Rabbis Without Borders fellowship, sponsored by the National Jewish Center for Learning and Leadership. 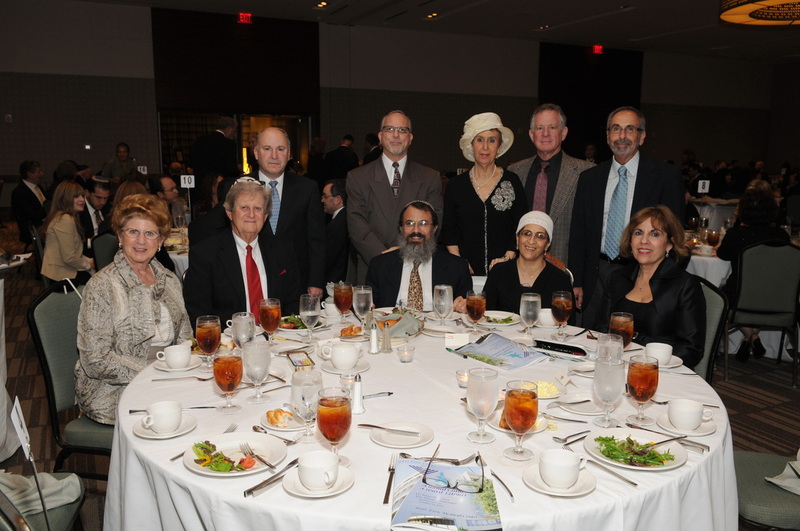 Rabbi Schlesinger also created “Faiths in Conversation,” a Jewish, Christian, Muslim interfaith dialogue series sponsored by the Memnosyne Institute, where he is also a leader and participant. The Memnosyne Institute mission is to help the diverse people of the world consciously encourage an evolution for themselves and for future generations by providing mankind with the means to encourage positive, peaceful global collaboration in areas of knowledge. Mary Ann Thompson-Frenk, founder of the Memnosyne Foundation along with her husband and co-founder Joshua Frenk, are delighted to select Rabbi Hanan Schlesinger as an Interfaith Scholar and feel he will be an excellent representative of the goals Memnosyne seeks: understanding through the peaceful open exchange of ideas, fostering shared human values, establishing opportunities to unite in thought and collaborate in action, and to promote global peace by recognizing the value of each individual’s knowledge. Both founders emphatically state that Rabbi Schlesinger’s knowledge of Judaism from his advanced Jewish studies, sharp mind, leadership skills and community experience make him an ideal addition to the Scholar’s program. The Memnosyne Institute through its many programs, philanthropy and vision for a Campus for Humanity is an important leader envisioning Dallas as a destination city for cross cultural collaboration, discovery and education. As part of the 2013 Dallas LearningFest, Rabbi Schlesinger presented three classes at the JCC on Sunday, February 10th. Links to the presentations are below. “Passover Participation Primer” Click here for text. Click here for audio. “Our Messiah, Their Messiah” Click here for text. Click here for audio. On Sunday, August 26 at 7:30 pm Myra and Stu Prescott hosted an evening of food, friendship and inspiration for the JSI Kick-off Event. Rabbi Schlesinger presented some exciting new developments for JSI, and taught a class entitled “The Global Politics of Rosh haShanah and You”. Opportunity was provided to offer support for JSI for the coming year. As part of the 2012 Dallas LearningFest, Rabbi Schlesinger presented two classes at the JCC: “Extricating Ourselves From the Garden of Eden” on Sunday, January 29, 2012, and “Why the Jews Rejected Jesus” on Sunday, February 5, 2012. Chosen from more than 90 applicants, Rabbi Schlesinger is one of this year’s 22 fellows participating in Rabbis Without Borders (“RWB”), the landmark initiative of CLAL. Clal is Hebrew for inclusive.